Strong: USD / JPY. The preferred range is from 6 to 8. Average: GBP, CHF, NZD. The preferred range is from 4 to 5. 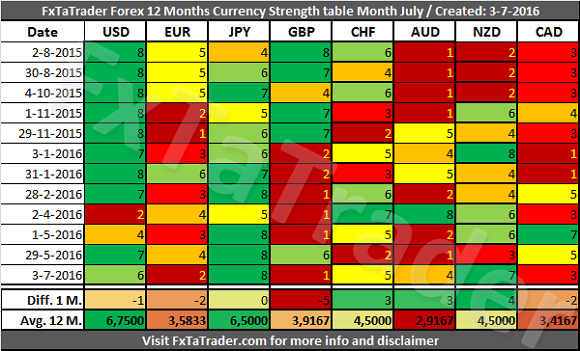 As can be seen in the "Currency Strength Table" here above the CHF has lost strength lately and is at the same 12 Months Average score as the NZD. For that reason the CHF changed classification from "Strong" to "Average". 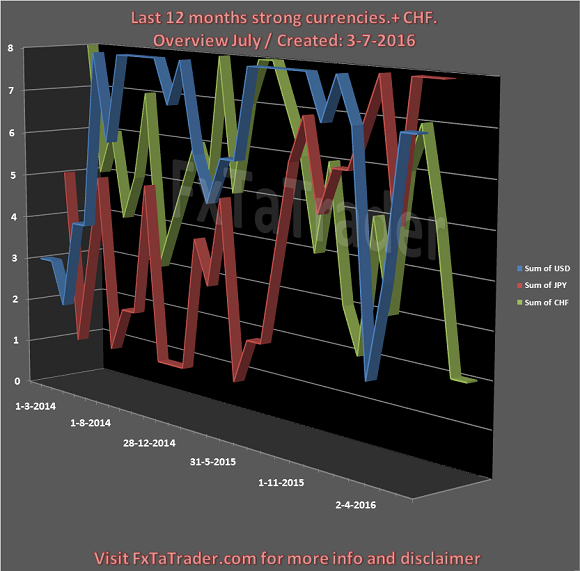 The CHF was also only 5 months stronger in the last 12 Months comapred to the NZD. When looking at the 12 Months Average scores it is clear to see that the USD and the JPY, being strong currencies, are having a much higher score being above 6. 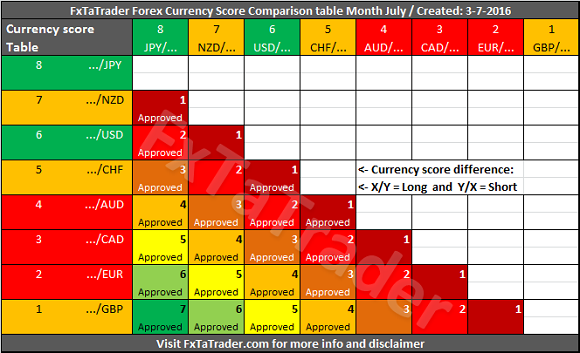 Here below you can see the last 12 Months Currency Score Graph with the strong currencies, USD and the JPY, and the CHF which is now an average currency. GBP, EUR and the CAD. GBP, AUD and the NZD. GBP/JPY, GBP/NZD, GBP/USD, EUR/JPY, CAD/JPY, GBP/CHF, AUD/JPY, EUR/NZD, CHF/JPY, USD/JPY, NZD/CAD and the NZD/JPY. GBP/JPY, GBP/NZD, GBP/USD, EUR/JPY, CAD/JPY, GBP/CHF, AUD/JPY and the EUR/NZD. All the pairs are mentioned as "Approved" pair in the "Currency Comparison Table". The CHF/JPY, USD/JPY, NZD/CAD and the NZD/JPY are not mentioned in the Top 10 of the Ranking and Rating list. All pairs are mentioned as interesting according to the combinations mentioned in the crossed join here above. The pairs mentioned in the "Ranking, Rating and Score" have the preference according to the order in the list and the combination with the position in the "Currency Comparison Table" and how the charts are looking.